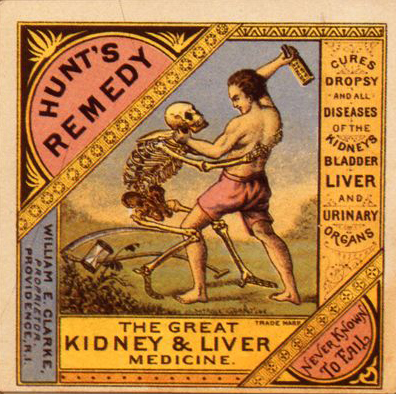 Summary: Trade Cards advertising proprietary medicines, late 19th and early 20th centuries. Abstract: Among the largest groups of advertisers in the eighteenth and nineteenth centuries were the manufacturers of proprietary medicines. They heaped praise on their nostrums when newspapers began to carry advertising, and more than one newspaper was able to continue publishing because of their continuous demand for space. When monthly and weekly journals commenced publication, they advertised in them as well. In their continual search for new media to carry their hard-selling messages, they were always among the first and invariably were the most prolific users of space in every new venture. When posters appeared in the scene in the middle of the nineteenth century, the merits of Ayer’s Sarsaparilla and Dr. Harter’s Iron Tonic were posted on the outside walls of buildings and the inside walls of pharmacies for all to see. And when inexpensive color lithography permitted the printing of small advertising cards in economic quantities, both entrepreneurs and small businessman were quick to adopt this novel approach. Trade cards, or tradesmen’s cards, had been used by pharmacists and their colleagues in the health professions since the seventeenth century, when copper engravings were used to create appropriate messages. William Hograth in England and Paul Revere in the United States were among the artists and skilled craftsmen who created these cards. The advent of lithography in the early nineteenth century made such cards available to all, and the advent of color printing soon spawned an industry in which millions of cards were published, advertising every type of product and service. Cards for over-the-counter medicines used beauty, humor, sentiment, history and patriotism among the many other appeals, always with the desire to attract the attention of the prospective buyer. The Brooklyn Bridge, the Statute of Liberty and the Washington Monument were architectural examples that appeared in trade cards. Subjects on the cards often had little or nothing to do with the products advertised; on printers’ “stock” cards, the same illustration could be used for many varied products, with only the imprint being altered. Texts, usually printed in the reverse of the card in black and white, frequently promised complete and rapid cure; cards for Dr. Thomas’s Eclectric Oil, for example stated that “It will positively cure toothache in 5 minutes, earache in two minutes and deafness in two days.” Trade cards were given to the pharmacist along with quantity orders shipped by the manufacturer, or by traveling salesmen then called “drummers” as a sales incentive. The pharmacist would include trade cards in wrapped packages or even mail them to purchasers on request. Always without a charge, of course. A favorite Victorian pastime was collecting and pasting them in albums; today they are often found with their backs completely obliterated because of this popular pastime. Trade cards were often signed by the publisher, and firms such as Currier and Ives, Louis Prang, J.H. Bufford, and Major and Knapp were frequently seen. As commercial objects, signatures of individual artist are rarely noted, but we will see, many trade cards for proprietary medicine had considerable artistic merit.